I will cover the best ways to measure your temperature (including a neat wearable that tracks your body temperature around the clock). And most importantly, what the numbers mean for you and your health. 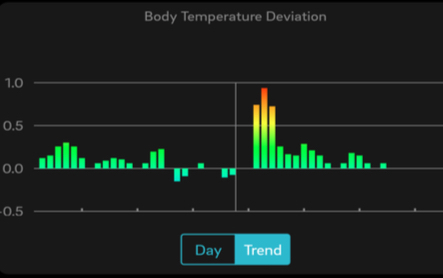 Note: If you are after a simple body temperature tracking guide that helps you discover what is going on with your health, recovery, metabolism and more, be sure to download my body temp tracking log and recovery sheet HERE. Our body temperature reveals a lot of information about our health. Our temperature provides an insight into hormonal health, can assist us with training and recovery decisions, woman can use it to determine the stage of their cycle. Even temperature fluctuations during the day can help one learn if they are utilising food for energy or being reliant upon adrenal energy. Our body temperature closely reflects our bodies metabolic rate. Metabolic rate is associated with many things including thyroid health, body fat levels, immune function, energy levels and general health. But the obvious link is between metabolic rate and heat output. Someone with a high metabolic rate will be warm to touch and have a high body temperature reading. Body heat is needed for all sorts of vital health functions - from tissue renewal and repair to enzymatic functioning and fighting off pathogens. A warm body - as long as it's not too hot- is a sign of a healthy thriving body. Chronically low body temperatures is synonymous with decreased vitality and wellness and are a clear sign of a slowing metabolism. An extreme example of this is an elderly woman wrapped in jackets, beanies, gloves and scarves despite it being a hot summers day outside. Tracking your body temperature on a daily basis (or even multiple times during the day, I'll cover more on this below) is a simple, fast and free way to gain a snapshot of your current health. If you can track your temperature on a regular basis (Print out my tracking log here to help with this) then you can turn this snapshot into a story - a story that will reveal patterns, trends and outliers. All which provide rich data to help track your health, training and vitality. In todays modern world we often overcomplicate things. 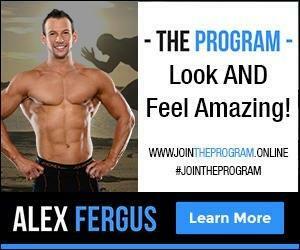 We go on fad diets to regain health instead of going back to the basics, we follow radical training programs in the quest to slim down and we use expensive lab testing to discover the health of our body. All these things have their place, but often it's beyond what is needed. In the early 1900's resting body temperature was commonly used by doctors to test for health issues and slow metabolic rates. A low body temperature would indicate an underlying health issue and treatments would start to address the issues. The physician would be able to track patient progress through ongoing body temperature readings. In fact, the patient could easily track their own temperature in the comfort of their own bed. No blood tests or MRI machines needed. Yet today it is rather uncommon for an adult to track their body temperature. The exceptions being females who track their menstrual cycles, those who fall sick and bring on a fever, and of course my coaching clients (I monitor their waking temperature every day). 3. And the elimination of nitrogenous wastes. 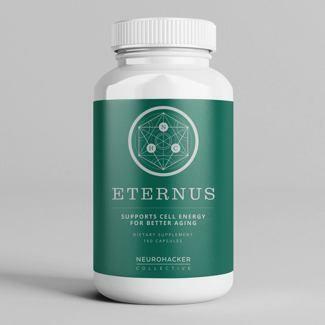 These enzyme-catalyzed reactions allow organisms to grow and reproduce, maintain their structures, and respond to their environments"
Thus a good metabolism ensures conversion of the food we ingest into energy, repair and growth and to thrive in our environment. As I outlined above, a lowered metabolic rate can have negative consequences for ones health. Energy output is lowered. Recovery and repair slows and of course body temperature drops. But a low body temperature can also be a tell tale sign of hypothyroidism and resulting weight gain. The bodies thyroid plays a vital role in determining ones metabolic rate and our body fat levels. T3 (the active form of thyroid hormone) is needed for cells to create energy and when these levels are low metabolic rate slows. With a lowered metabolic rate the body uses less energy, increasing the likelihood of fat gain. A study titled 'Is obesity associated with lower body temperatures? Core temperature: a forgotten variable in energy balance' found that a body temperature drop by 1 degree celsius lowered metabolic rate (energy expenditure) by up to 13% (2). A lot of clients come to me with these symptoms. One of the first things I have them do is track their morning body temperature. Nine times out of ten they have a low body temperature reading. In this situation I will send them off for a full thyroid blood panel, but I continue to monitor their daily body temperature to track progress as they work through my coaching program. But this isn't a revolutionary idea. Using body temperature to test for thyroid health has been around for a long time. 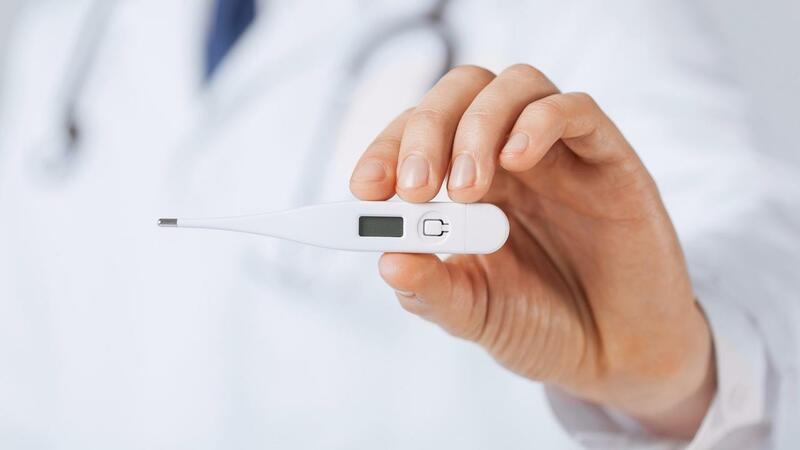 Doctor Broda Barnes established the "basal body temperature" test (which involves taking your morning body temperature for three days and finding the average). Dr Barnes understood that thyroid hormone is so vital to cellular metabolism. And reduced thyroid function often presents itself in body temperature levels away from the normal level of 98.6F / 37C. If weight loss is a problem for you, or you are seeking ways to improve your health and vitality then I highly recommend you start tracking your body temperature! 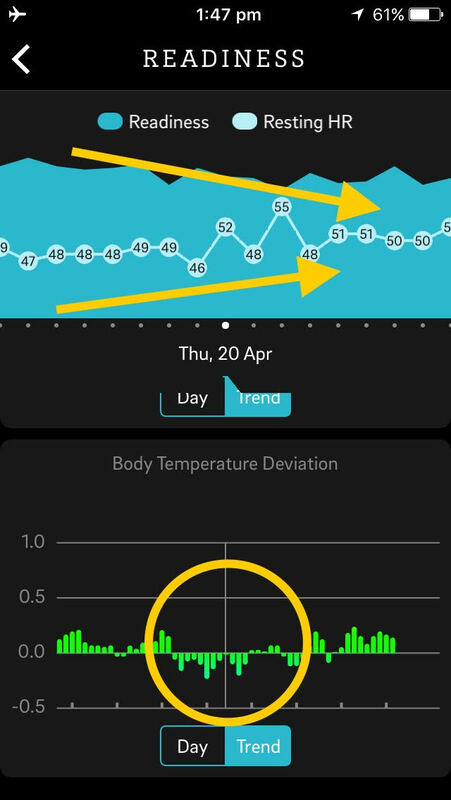 Even on a less serious health front, temperature tracking can help one determine when they have recovered from an illness (or are coming down with an illness). Above is a screenshot from the Oura Ring App. Think of the Oura Ring as a fitbit on steroids (yet a fraction of the size). 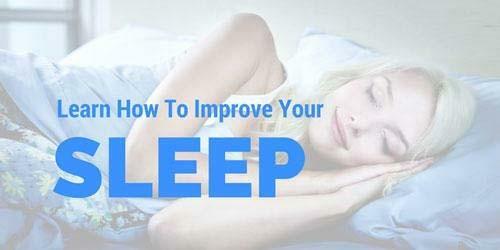 It measures sleep, resting heart rate, movement, respiration rate, heart rate variability and body temperature. The Oura ring measures the changes in skin temperature every night to derive the user’s core temperature level. 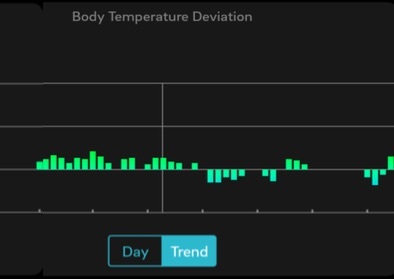 The trending of this data over several nights provides valuable insight into the user’s health by comparing daily temperature fluctuations to your established baseline. Acute elevated temperature readings are often an early warning of impending sickness. Below you can see more temperature data from the Oura Ring. In this situation, the woman who was wearing the Oura Ring reported having a flu for a week. You can see the spike in body temperature readings and the gradual tapering down to baseline. Information like this is extremely useful for individuals who want to track their health. Athletes for example can determine when they have recovered from an illness before returning to hard training. Temperature tracking isn't only useful for monitoring metabolic health and illness. 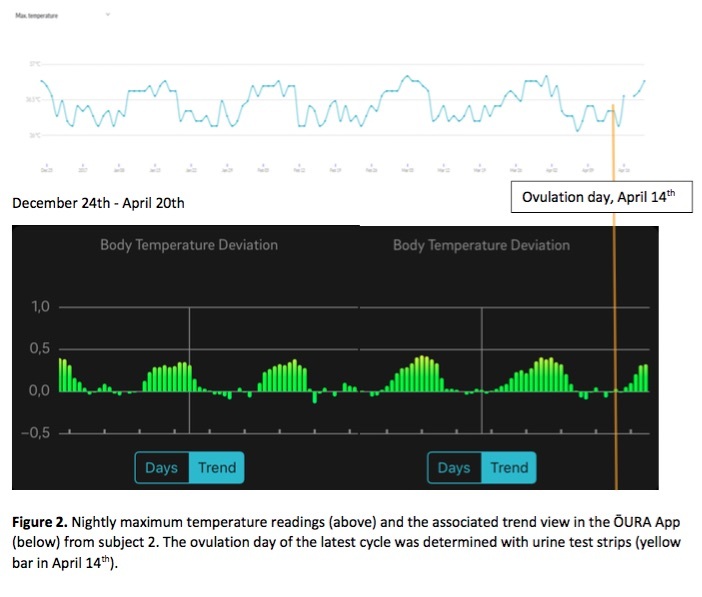 Woman have been monitoring their temperature for years to track their menstrual cycle. Their are many journals, books and even apps that help woman chart their body temperature and determine when they are ovulating etc. If you have an Oura Ring you can utilise the ring to monitor your temperature trends. Below is a screen shot of the data generated from the Oura Ring. The top graph shows nightly maximum temperature readings (plotted in the Oura Web Cloud) and the bottom graph shows the temperature trends in the Oura app. The temperature data provided by the Oura Ring helps woman track their menstrual cycle, ovulation and fertility, especially when used in conjunction with other sources of menstrual tracking. Obviously you don't need a fancy health wearable to track all this data. A simple thermometer combined with my temperature tracking log will suffice. But for those woman who frequently forget to measure their temperature in the morning, the Oura ring is appealing alternative. Any serious athlete understands the importance of recovery. Training itself is one side of the coin when it comes to increasing performance. If recovery is inadequate for the training load then your performance will suffer. Athletes can utilise body temperature tracking to determine how their body is coping with their current training load. If you are looking for an edge in your sport then start entering your numbers in tracking log I have created. This will provide you with a good set of data to help you monitor recovering. For example, a plummeting body temperature during a heavy training load may be an early sign that you need to back off and give the body some rest. This recently happened to me during my training for the Real Fit competition (Read more about that here). You can see with my own Oura Ring Data how my readiness score dropped and resting heart rate increased. At the same time you can see my body temperature trending down. This all happened during an intense part of my training. After seeing these changes I cut back on my training load and my body numbers soon returned to baseline. Those without an Oura Ring should measure their temperature with a thermometer and logging the data in my tracking log. This will help them see trends and potential issues. For the female athletes tracking your body temperature trends can provide useful guidance for your training program. Recent studies suggest that woman should restrict the amount of high intensity training during the later half of their menstrual cycle. A 2016 study found that positive training adaptations can be enhanced by concentrating a higher proportion of intensive trainings with the first half of the cycle (1). Enough about the benefits of tracking your temperature. Let's look at the best ways to measure our temperature and also what a good temperature looks like. When it comes to measuring your temperature you will find a wide range of tools. I have listed the pros and cons of various types of thermometers below. Digital Thermometers: Costing only a few dollars at any chemist or supermarket they are simple to use and provide results in a few seconds. Unfortunately they aren't the best for accuracy. Use these orally, under the arm or rectally. If you are on a budget and not particular about accuracy then these are a suitable option. Analogue Thermometers: Mercury thermometers are the best thermometer you can use. But they are banned in many countries due to mercury being a toxin for human health. Instead you could use the mercury free Geratherm thermometers. This is what I recommend my clients use as they are extremely accurate. Their downside is that they require 5-10minutes for an accurate reading. Note - with these thermometers you need to give them a solid 'flick' to reset the thermometer back to baseline after use. The Geratherm thermometer retails for $10-30 online. Infrared Digital Thermometers:These are commonly used with infants as a less invasive way to track temperature. I personally haven't used one, but I have heard their accuracy can be hit and miss. Plus they are pricey. I don't recommend using these. 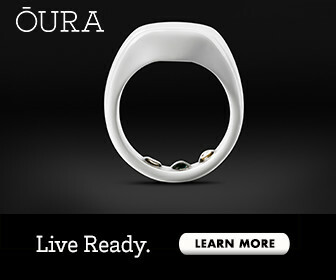 Oura Ring: Though this isn't a thermometer per se, it does have a body temperature measuring function. The Oura ring is a wearable health device that measures a range of metrics including your temperature. It is [a] body temperature based on measurement from the finger. The ring measures the body temperature in degrees centigrades resolution between the nights. Even though it is measured from the skin we have validated it to be equal to core body temperature during the night when you reach the lowest body temperature. So, it's like you would be having thermometer on all the time during the night. The Oura Ring is an expensive option when compared to the other devices available (use ALEXF to get a discount code for the ring), but its features go well beyond simple temperature tracking! The ring accurately tracks sleep, movement, respiration rate, heart rate, heart rate variability and presents all this data in an easy to use app. For more about these features be sure to check out my Oura Ring review here. Personally, I wear an Oura ring (and have done for over a year). I use the body temperature data it provides but I also use an analogue Geratherm thermometer to collect data for my temperature tracking log (you can download a copy for yourself here). Over the top? Probably. But I am a Bio-hacker, so the more data I can collect on my body the better! What Is a Good Body Temperature? Now for the part that you have all been waiting for! What is a good healthy body temperature? It depends. It depends on the time of the day, your cycle stage (for woman), whether you have eaten and if you have taken any stimulants. But as a rough guide, a healthy waking body temperature should be 36.6 C-37.0C (97.9F - 98.6F). Woman starting their cycle should see a lower reading about 0.3C (0.5F) lower. Stress hormones can elevate the body's temperature to 'normal' levels. This may look good on paper, but it's not a good state to be in. I cover ways to test for this later. Below I cover various testing protocols so you can turn your body temperature number into useful information. I have packaged all all these reference ranges into a simple to follow one page tracking guide that you can download here. A high metabolic rate will see a peak temperature of around 37.2-37.5 C (99F - 99.5F). Optimally you shouldn't be below 36.7C (98F). You can track your daily average by taking 4 readings a day (3 before each meal and once at bedtime) for 3 days. If your average is below 36.5 (97.7F) it suggests a thyroid issue that needs to be investigated. Your temperature should always rise after a meal (20-30mins post meal). If it doesn't rise, you may be running off adrenaline and crashing post meal. This should be addressed as soon as possible. If your temperature stays the same after a meal, it may mean it was lacking in calories or nutrients. Take your temperature before and after a training session. If you see a big drop after training this can indicate a suppressed thyroid. Meaning the session was too intense, too long or both. Focus more on recovery and look at cutting back on the training load. I mentioned above how a normal to high temperature can be a result of high levels of stress hormones in the body. If a highly stressed individual undergoes an intensive recovery program, they may see a drop of temperature during this recovery phase. This is not a bad thing, instead it indicates transformation and healing. I often see this with clients on my coaching program. They come to me in a stressed state, their temperature readings look good but they express all the other signs of a body under stress. I put them on a 6 week recovery phase and their body temperature starts falling. Of course the client starts feeling a lot better and eventually their temperature rises back to a healthy normal reading. This time without the stress levels to go with it. I know there is a lot of data, rules and reference ranges to work through here. To simplify things I have made a temperature tracking log that includes all the key information to help you interpret your numbers. I recommend filling this log out for at least 2 weeks to help you determine your current state of health. You can access this FREE log here. To use this tracking log you only need a standard thermometer. But if you are really serious about optimising your health and tracking your temperature, be sure to look into the Oura Ring. You can read my comprehensive review on the Oura Ring HERE and I have a discount code that can be accessed here. Of course if you need me to interpret your data and help you increase your energy, metabolism and vitality please contact me HERE. This is an article for another day. If you are seeing chronically low numbers then it is a good sign something needs fixing or improving. In a situation like this I recommend taking a good look at the quality of your diet, your sleep, your lifestyle and your training. 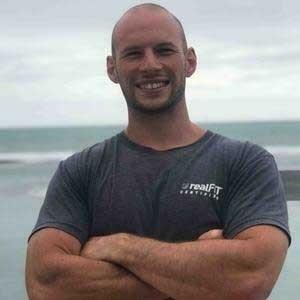 For resources to help improve your health be sure to check out my optimal health resource page. Until then, start plugging your numbers into my tracking log as this data will be useful for when I publish my article on increasing metabolism.